The impulse to escape notice is not about complacent isolation or senseless conformity, but about maintaining identity, autonomy, and voice. In our increasingly networked and image-saturated lives, the notion of disappearing has never been both more enchanting and yet fanciful. Today, we are relentlessly encouraged, even conditioned, to reveal, share, and self-promote. The pressure to be public comes not just from our peers, but vast and pervasive technology companies, which want to profit from patterns in our behavior. A lifelong student and observer of the natural world, Busch sets out to explore her own uneasiness with this arrangement, and what she senses is a widespread desire for a less scrutinized way of life–for invisibility. Writing in rich painterly detail about her own life, her family, and some of the world’s most exotic and remote places–from the Cayman Islands to Iceland–she savors the pleasures of being unseen. Discovering and dramatizing a wonderful range of ways of disappearing, from virtual reality goggles that trick the wearer into believing her body has disappeared and to the way Virginia Woolf’s fictional Mrs. Dalloway feels a flickering of personhood as an older woman, Busch deliberates on subjects new and old with equal sensitivity and incisiveness. A unique and exhilarating accomplishment, How to Disappear is a shimmering collage of poetry, cinema, memoir, myth, and much more, which overturns the dangerous modern assumption that somehow fame and visibility equate to success and happiness. Busch presents a field guide to invisibility, reacquainting us with the merits of the inconspicuousness, and finds genuine alternatives to the typical life of perpetual exposure. Accessing timeless truths in order to speak to our most urgent contemporary problems, she inspires us to develop a deeper appreciation for personal privacy in a vast and invasive world. Akiko Busch is the author of several essay collections, including Geography of Home, Nine Ways to Cross a River, and The Incidental Steward, published by Yale University Press in 2013 and awarded an Honorable Mention in the Natural History Literature category of 2013 National Outdoor Book Awards. She was a contributing editor at Metropolis magazine for twenty years, and her work has appeared in numerous national magazines, newspapers, and exhibition catalogs. She is on the faculty of the School of Visual Arts in New York City and lives in the Hudson Valley. Read the book on paper or screen, or listen to the audiobook (sample). 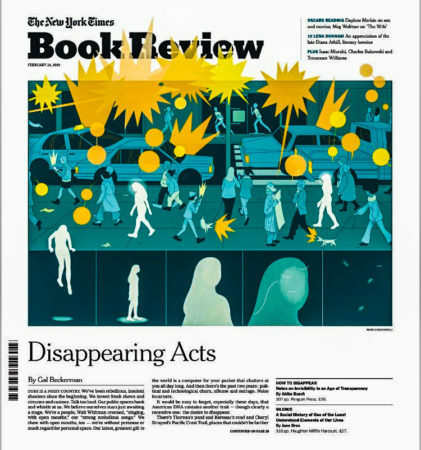 Read the front-page review in The New York Times Book Review. Read an excerpt in the Atlantic. Listen to NYTBR editor Pamela Paul and reviewer Gal Beckerman on the NYTBR podcast (@1:145ff.). Akiko Busch: I think being unseen can give one a sense of autonomy, privacy, individuality, voice; I think being unseen is not necessarily about having a sense of power but just a sense of interiority, I think, that can be really vital to human expression … For children, invisibility is a source of tremendous creativity. It’s where they discover knowledge and self-knowledge, whether it’s through invisible ink and, you know, writing with lemon juice and a toothpick and learning that words have a kind of evanescence, or whether it’s in private places; children’s literature is full of, exactly as you say, kids going off to be by themselves, whether it’s the unseen corridors of the Plaza by Eloise, the wardrobe in Narnia, children search out private places for solitude; likewise the invisible friend, who was long regarded as a sign of some kind of dysfunctional childhood, has since been recognized as a kind of consort that allows a child to work through isolation or loneliness or disappointment or all kinds of different experiences, and imagining the invisible friend is a creative exercise, so I think for kids the invisible world is a place of tremendous knowledge and power, and it’s only as adults that we begin to associate invisibility with transgression. Joe Donahue: I don’t think I’ve ever said goodbye to my invisible friend. Akiko Busch: Oh, lucky you!